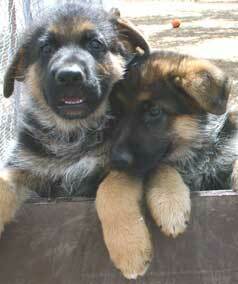 Got a new German Shepherd puppy? Then get ready for the puppy teething blues. One of the things you may, or may not, be prepared for when getting a new puppy is its desire to chew. Often this can be quite destructive depending on exactly how you handle this situation. Instinctively German Shepherd puppies often chew because they need to - not because they want to destroy your personal items. Overall, the best thing you can do is protect your German Shepherd puppy from potentially harmful situations and help set him up to be successful in getting through this important developmental stage. As puppies begin to loose their “milk teeth” and get their 42 adult teeth they chew to help alleviate some of the discomfort they are experiencing. This is known as teething. Below you’ll find several dog training ideas to help your puppy through these teething issues, and to keep your pup from being “bad” and to help it get through this stressful period. • Give your puppy one of its toys when it acts as though it may chew something it should not • Use commercial sprays to alleviate chewing of household items - Listerine is also good • Move items you do not want the puppy to get into out of its reach - cover all power cords, remove pens/ pencils, plants (many are poisonous), books, etc. • Give your puppy toys of its own to chew on - it is also good to give these to your pup when he begins to teeth on you. 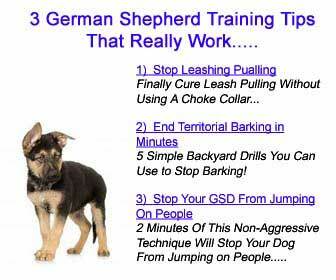 With a little bit of planning, patience and caring, you can help your German Shepherd puppy through this important teething stage of it's life. Recommended Reading: Did you know that dogs are perfectly capable of learning not to chew your stuff or bite on you – you just have to put in a little effort first. Learn more here! Or, click on the graphic below.